Via View From the Wing, select Hyatt hotels are pricing premium rooms for the same as the Points + Cash rate for standard rooms! 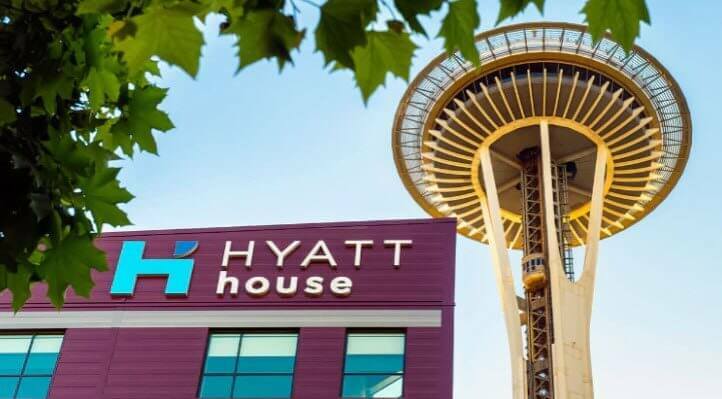 Folks headed to major cities, like Chicago, Houston, Seattle, and Washington, DC, can book a suite at several Hyatt Place and Hyatt House locations for less with this deal. We don’t know how long this will last, so book soon if you’re interested! With This Deal, You Could Book a 2-Queen Kitchen Suite at the Hyatt House Seattle/Downtown for the Points + Cash Price of a Standard Room! Several Hyatt House and Hyatt Place locations in the US are offering suites for the standard room Points + Cash rate! There aren’t a lot of options to choose from, but nearly all of them are in major cities. If these hotels fit your travel plans, this could be a great deal! For example, you could book a king bed one-bedroom suite (with sofa bed) at the Hyatt Place Chicago Midway Airport. The room costs ~$325 after taxes. Or, you can pay 4,000 Hyatt points and ~$65 after taxes. That’s a value of ~6.5 cents per point ($325 room rate – $65 taxes & fees / 4,000 Hyatt points)! Or you could book a king bed one-bedroom suite (with sofa bed) at the Hyatt Place New York/Yonkers for 6,000 Hyatt points and ~$86 after taxes. The room costs ~$317 including taxes, so you’re getting a value of ~3.85 cents per point ($317 room rate – $86 taxes & fees / 6,000 Hyatt points)! Hyatt is my favorite hotel chain. I consider them to have the best balance of value and comfort. I love to transfer Chase Ultimate Rewards points to Hyatt for free hotel stays. Remember, you can transfer Chase Ultimate Rewards points to Hyatt to top-off your account for an award stay if you have the Chase Sapphire Reserve, Chase Sapphire Preferred Card, Chase Ink Business Preferred Credit Card, or (no longer offered) Chase Ink Bold or Chase Ink Plus. And if you have one of the cards listed above, you can indirectly transfer points earned from the Chase Freedom, Chase Freedom Unlimited, and Chase Ink Business Cash cards, too! You can also open the Chase Hyatt card to earn a bunch of Hyatt points in a hurry! This card is NOT affected by Chase’s strict application rules. At select Hyatt House and Hyatt Place hotels, you can book suites at the same Points + Cash rate it costs to book a standard room! If there is a location that fits your travel plans, this could be a great way to get exceptional value from your Hyatt points. And there are deals in some great cities, like Boston, Miami, Seattle, Denver, and Houston! We don’t know how long these deals will last, so if you see a room you want, it’s a good idea to book soon. Let me know if you reserve a deal!